Or get the deck (choice of large or standard size) by itself. Measurements: 2.75 x 4.35; or 70 x 110 mm. Back of card: A cross with gray, red, yellow & blue arms & petaled flower at the crossing. Behind is a checkerboard which seems to fall in towards the cross. Book included: Yes, 209 pages, 4.55 x 7.05 inches, or 11.7 x 18 cm: Tarot, Mirror of the Soul, by Gerd Ziegler, illustrated. This is the same book as the one with the same title, by the same author, but in a smaller format. Publisher: US Games. Book printed in Germany, the cards are not identified. All three of the Magicians. There is only one magician in this deck. For all three, go here. Comments: In this deck, major arkana cards are labeled Trumps, minor arcana suit cards have a keyword printed at the bottom (hard to read on the actual card & impossible to show on the illustrations above). There's also a mysterious black card with a modified Star of David in red. 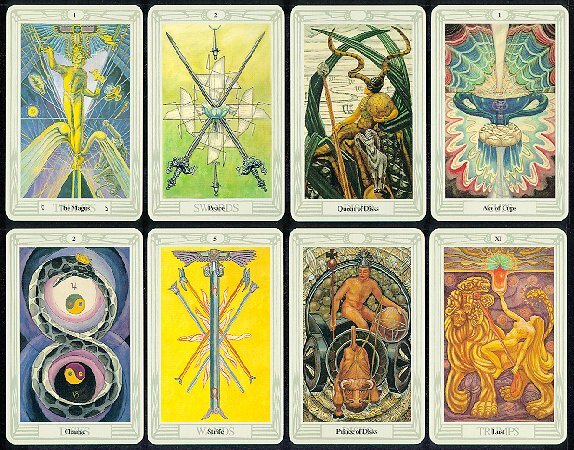 Notice that suit cards (ace through 10) often have no symbolic pictures, just the specified number of objects. This is a throwback to the pre-Rider Waite days & obviously not an accident. Crowley & Harris worked for five years on the cards, 1938-43, often painting many versions of the same card to get the final effect. Despite their efforts, the deck was not published until 1969, some 22 years after Crowley's death & seven years after Harris's. Crowley, of course, was the most famous - or notorious - magician of the 20th century. His only peer in the English speaking world was a woman who went by the name of Dion Fortune.